How do you buy for someone who is a frugal minimalist? They don’t want stuff they don’t need, and probably even consider themselves anti-consumerist, meaning they actively try to avoid buying things. 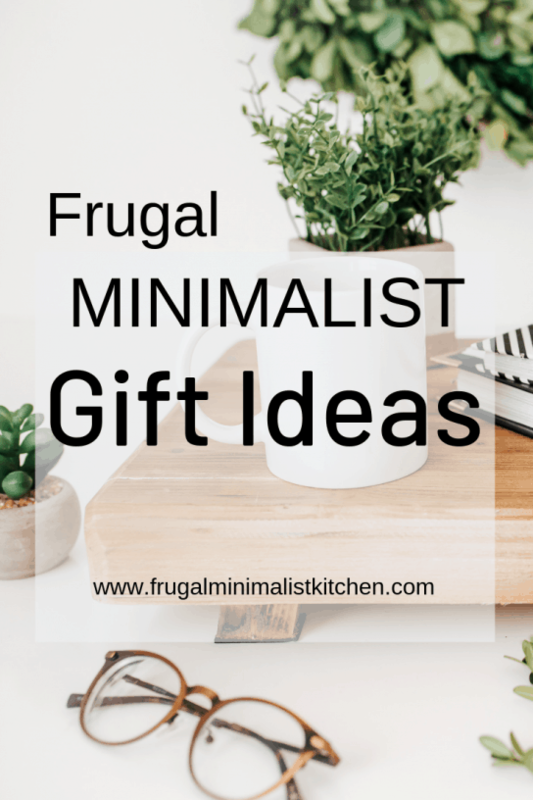 Gift giving as a frugal minimalist can I feel really stressful. Frugal minimalists know most people don’t need more stuff. How can you give meaningful gifts on a small budget without giving people stuff that they don’t need? This post contains affiliate links. I may earn a commission if you purchase something through a link, at no extra cost to you. Experiences are the perfect gift for a Minimalist because an experience as a gift is kind of like two gifts in one. They’ll love it because they get a gift that will be gone once used, preventing clutter, but also save them money on entertainment later on. Bonus if you get 2 tickets so you can go together and spend quality time together! Mermaid swimming lessons with AquaMermaid. Use coupon code: employeediscount to get 50% off trial classes! A frugal minimalist loves giving and getting consumable gifts. Like entertainment gifts, consumable gifts are great for a frugal minimalist because once they’re used, they’re gone. There is nothing left to clutter their mind or home! If you give something homemade or zero waste, there won’t be any garbage to clutter the environment either! Consumable gifts also save a bit of money from the grocery list so are great to give someone on a budget. We live on a low income and would much rather have some homemade food than any object like a picture frame or sweater. Smaller consumable gifts like a jar of jam, ½ dozen cookies, or a tin of loose leaf tea make excellent stocking stuffers as well! A frugal minimalist usually enjoys practical gifts because they don’t always want to buy them for themselves. The difference between the usual way of giving these gifts, and giving them to a frugal minimalist is that you need to make sure that the person actually wants the exact item that you’re getting. You need to ask them what they want, or listen carefully into conversations and find out what they’ve been talking about. See what they like on social media. Perhaps the brands they follow might give you a bit of insight as well, but it’s best to ask them to be sure. Cooking equipment like a good quality paring knife (only if they don’t have one!). This one has really good reviews. The key here is basics! Do not get fancy things that can only be used once in a while like Christmas socks or an avocado slicer. Do not just get someone a sassy thing just because it’s fancy. As with practical gifts, only get luxury items that they’ve specifically said that they want or need. One example might be a frugal person to has hand-me-down sheets that are falling apart. It would be great to get them a nice sheet set! Good quality linens are an investment but also a luxury that most frugal people, and many minimalists, wouldn’t buy for themselves because the ones they have are still ‘OK’. Luxury ‘items’ could also include luxury experiences such as a spa treatment or float session. Check Groupon for luxury items or experiences at discounted prices! Frugal minimalist people know the value of quality time with loved ones far surpasses any physical gift you could give. This can be combined with giving an experience as a gift or could be a coupon to be redeemed for a massage from you. Is money the perfect gift? Sometimes there are certain items that the recipient is saving for and you could give money towards the goal that they’re saving for. That would be great thing to do because then you know they’re getting what they actually want. For example, it would be amazing to get some cash towards the travel funds, or house down payment! I read this book about the economics of gift giving. It basically says gift giving is the worst possible way you could spend your money. The number of gifts that actually aren’t wanted or used is ridiculous. According to the book, billions of dollars are spent on unwanted gifts each year! The author recommends you just give money because then the person can get exactly what they want and need. Instead of spending $50 on a sweater they keep just because you gave it to them, you could just give you $50 and then they could buy a sweater (or something else) that they actually want. A downfall of giving money is that it can get awkward if you give each other money but one person gives more than the other. It can also be redundant if you just end up exchanging money. If you just give each other $50, you may as well not given anything at all. Frugal minimalists love this option because, again, there is no ‘thing’ to sit around the house collecting dust and adding to the clutter. If they’re on a tight budget they may not have a lot of money to give to organizations they care about, so making a donation in their name is a great way to support causes they care about. I hope this list of frugal minimalist gift ideas gave you some insight into what to get for your loved one! The main takeaways are to really consider the person’s interests and try to find an alternative to ‘things’ whenever possible! Save this for future reference for gift ideas for the hard to buy for frugal minimalist on your list. If you’re the frugal minimalist, share this list with family and friends so they know what to get you!